Now for a little spring! I have been trying to decide what to do next since I finished the fruit basket quilt. What I finally decided on is this. It makes me feel like spring! 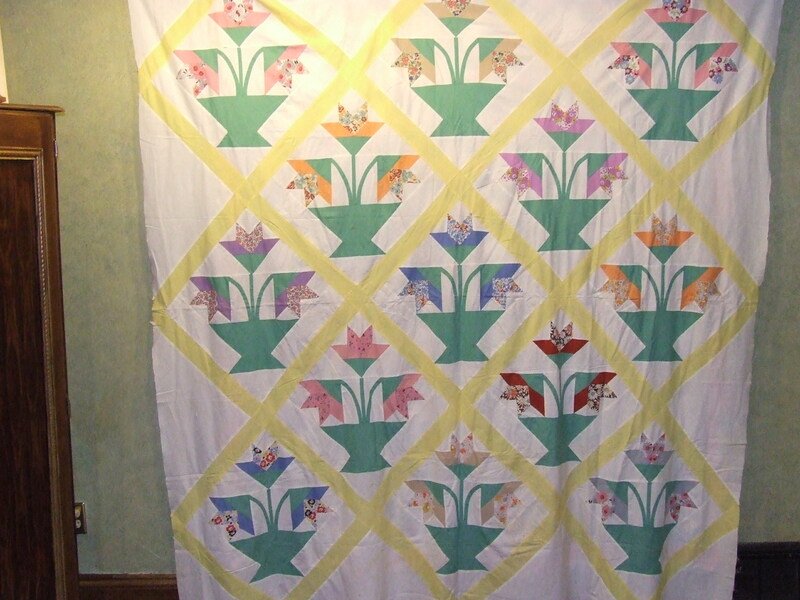 I love the colors and fabrics….the block has many names one of them is “basket of lilies” that also says spring to me. After all this snow and cold we have had this winter I am so ready for some sun and warm weather! 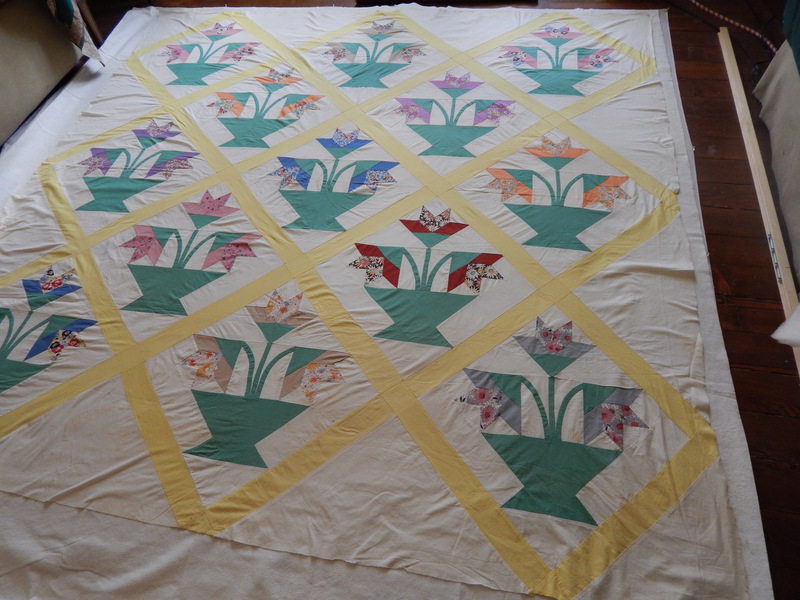 The top is all hand pieced and it is fairly large at 88″ square. I have it all basted and ready to start quilting. First I pin the backing fabric to the floor nice and tight. I use push pins to do this but if you don’t want to harm you floor you can use masking tape. Next I lay out the batting and smooth out all the wrinkles. In this case I am using Natures Touch Batting. The thing with hand pieced vintage tops like this (this one for the 30’s I believe) is that they rarely ever are perfectly flat so you wont be able to get out all the wrinkles and puckers. If you look at the triangles along the edges you can see some serious wrinkles! The cause of this is that they are cut with bias on the outside edge. This causes a lot of stretch and they get distorted when they are sewn in. I will have to fix that, but that will happen when I am ready to quilt one of those areas. I will do a post about how to fix it as soon as I get there. Those puckered setting triangles look pretty bad now but when I finish you wont ever notice there was a problem. 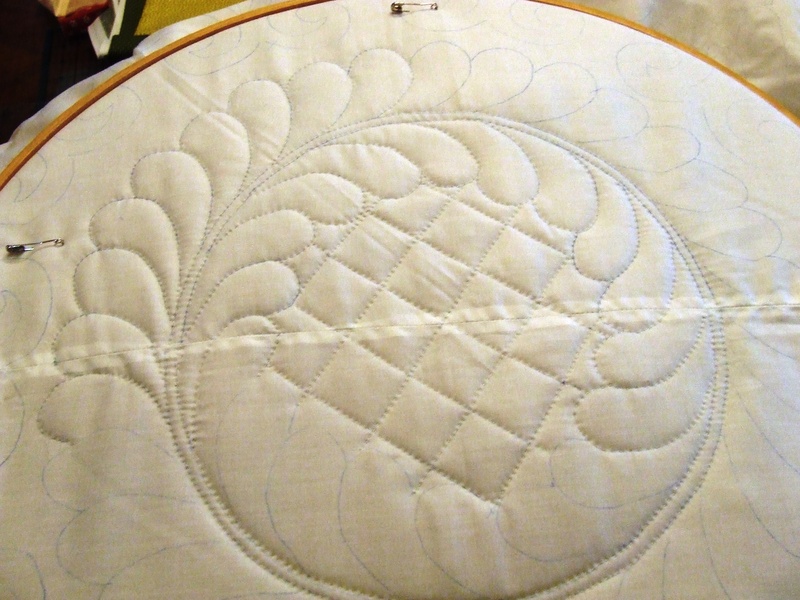 It is all set to begin the hand quilting….once I get it into the hoop I will decide how I want to quilt it. 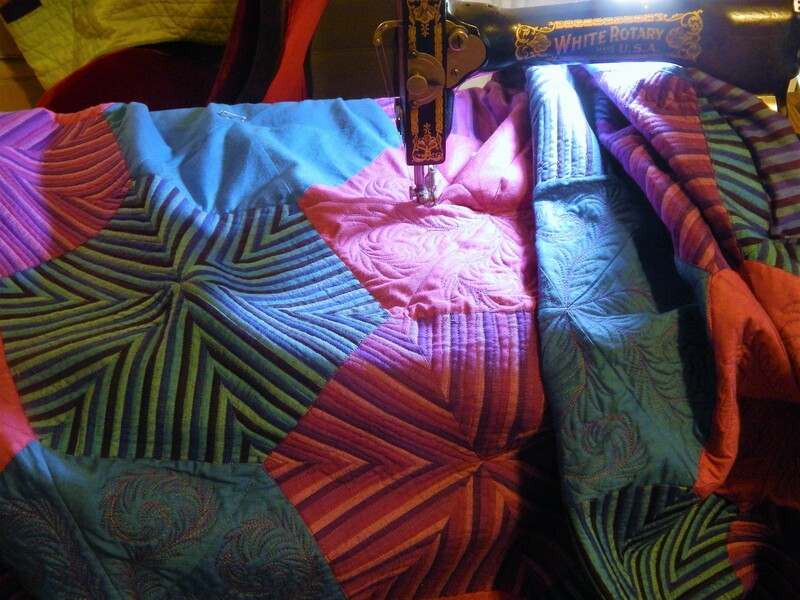 More often than not I don’t plan the quilting I just do it…. 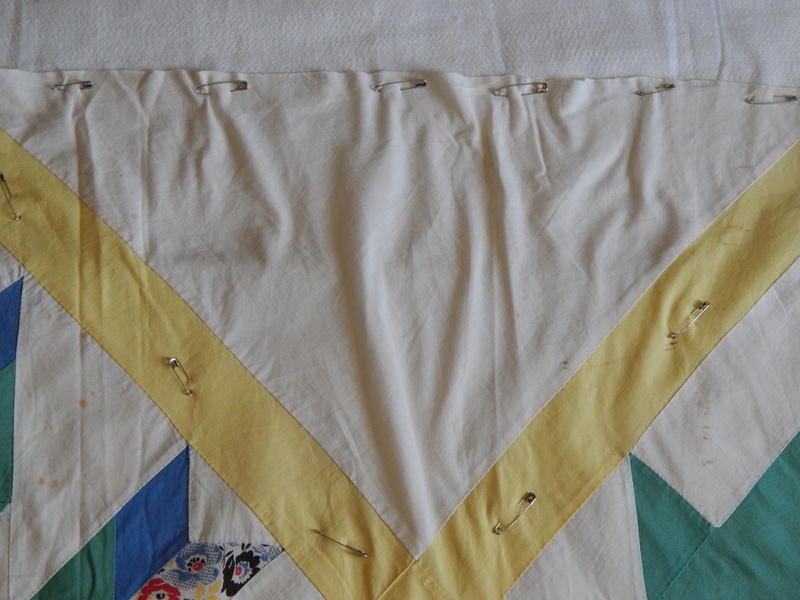 In my last post I showed how I did the binding on the fruit basket quilt. I failed to show a corner so here it is. 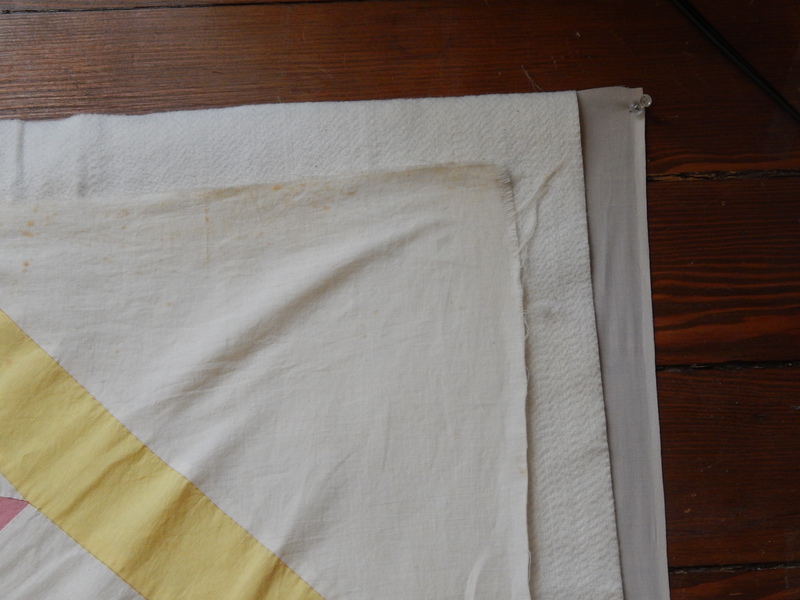 I did not miter, I just folded the end in and overlapped…then stitched it down…I hope that makes sense. Thanks for the comments on puckers! 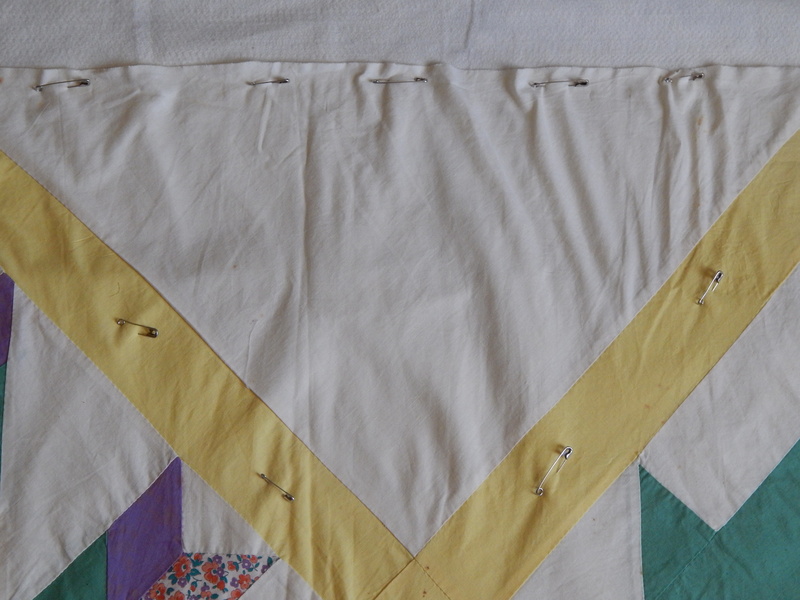 I just got down to the border for quilting on a quilt I made and found one border has a pucker and I was struggling with the thought of removing the border for a redo….BUT now I think I will just smooth it out, pin and give it a go! 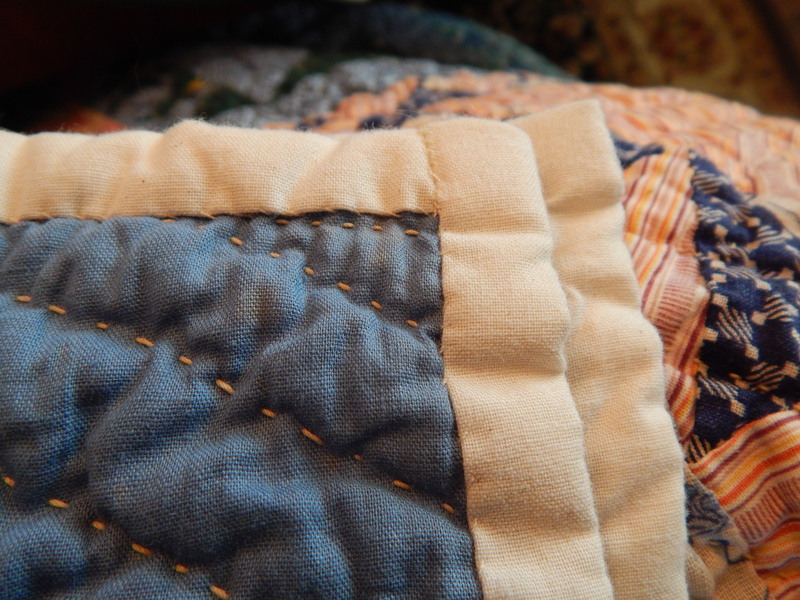 it is amazing how much puckering can be hidden when you quilt by hand…. 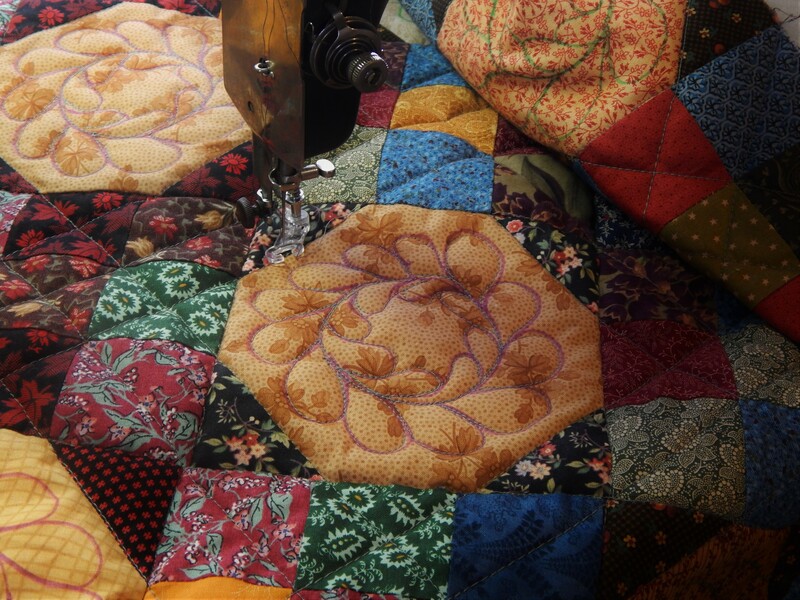 A lovely fresh quilt to encourage spring to arrive. I can’t wait to see how you deal with those stretched edges. I do hope that spring isn’t far away!!…. Very nice quilt, can’t wait to see what you do with it, or rather how you quilt it! I think I have feed sacks of all those prints in the flowers, such need fabrics! The solids are awesome and I keep trying to find good ones that mimic those old solids. 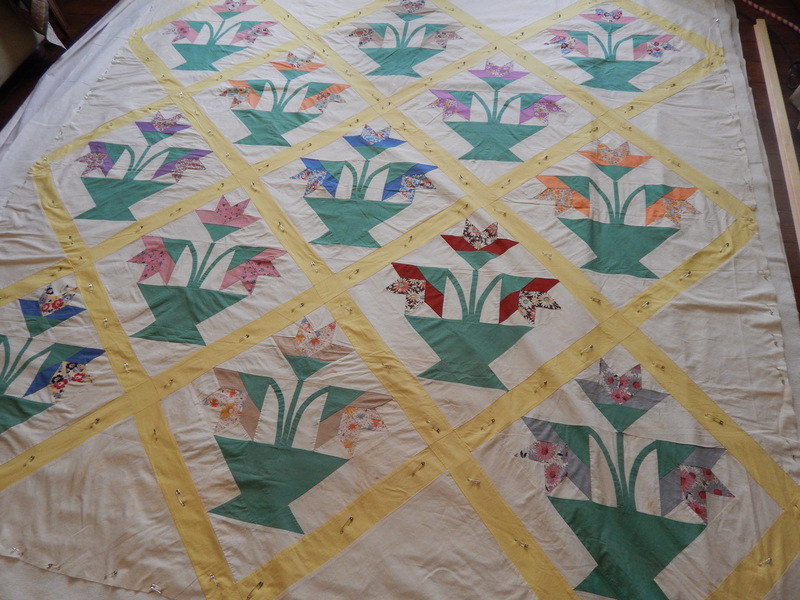 Hahaha….the floors are so old ( 120 years now…that the pin holes are nearly impossible to see…..
you are right about the solids…I would love to be able to find a lot of yardage of it….particularly the Green!! Hi!!!! I am so ready for spring!!!!! 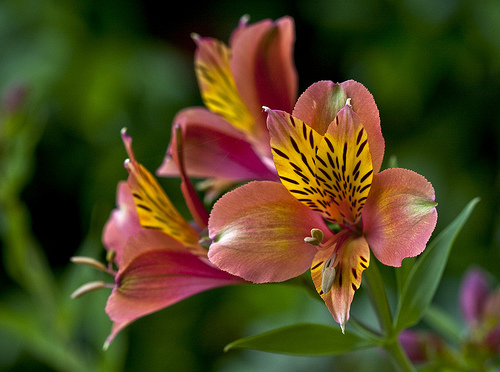 Lovely flowers for a cloudy day!!!! Thanks for the beauty!!!! It won’t be long till spring now!!!! I will be back to see your wonderful quilting!!!!! Thank you once again Tim for all the detailed explanation of how you do things. Especially this step-by-step (along with great pictures) of how you baste your pieces! Always learning something new from you even though I’ve been doing this a long time. I especially loved your pinning in just the sashing. Great idea. Gets the job done but not a lot to remove as you go. Curious to see how you quilt this one. So do enjoy your posts…….. This is great information too. Thank you again. What kind/brand of pins do you use? I have found over the years that with the better quality of batting, you are right saying sometimes little to no pinning is necessary. I agree-less is more. Agree with your comments about vintage tops being a little ‘wonky’ sometimes and do the same things smoothing, etc. I do hope you share details/pictures of how you treat the side triangles. Tim, I’m hand quilting a quilt I pieced with a black background. I’m having so much trouble with the batting poking through with my needle. I don’t know if it’s done that every time I’ve hand quilted, and I’m only noticing it now with the black background. 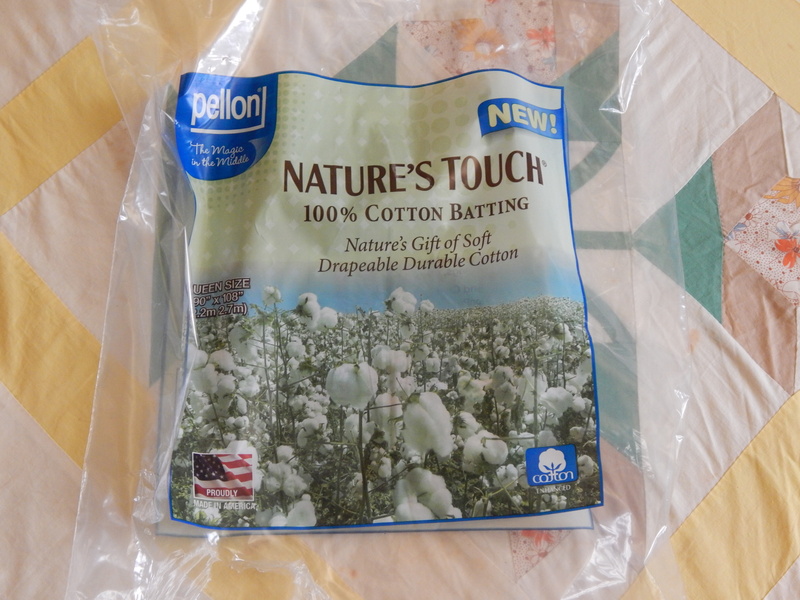 I’m using Warm and Natural, 100% cotton. Can the batting be basted to the top and back upside down? Seems like I’m remembering a little tidbit about that causing the batting to poke through to the top, but I can’t remember any other details. 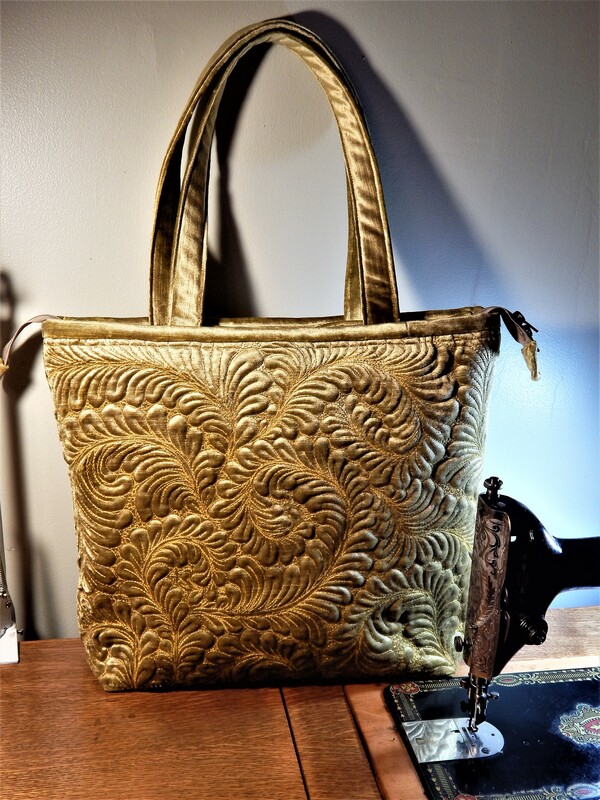 I have had that problem with black fabric…it is very frustrating! !…..they do now make black batting Hobb’s 80/20….but since you have already started it is too late for that….2 things that will help you 1. wax your thread …slide the thread across a beeswax before you thread your needle….the wax will help the thread slide through without catching the fibers and pulling them through….2. fabric softener….take a few fabric softener dryer sheets and soak them in a cup or so of water….then put the water into a spray bottle….spray it on the quilt top in the area you want to quilt and let it dry…then quilt….sometimes it is static electricity that makes the batting fibers attach to the thread and the fabric softener will help prevent that…..I fing that either way right side up or down it will still do that on some fabrics…so I don’t think it matters what side you use as up on the batting. and yes I believe this happens on other colors as well and we just dont notice because the contrast in color is not as great….it has happened to me on black, and navy blue and forest green. I hope that helps…and good luck!! Thanks Tim, this is the first black I’ve ever hand quilted. I’ve got both beeswax and fabric softener in the house, so I’ll try them both. great!…good luck again…and have fun!! Its nice to go with the Seasons. 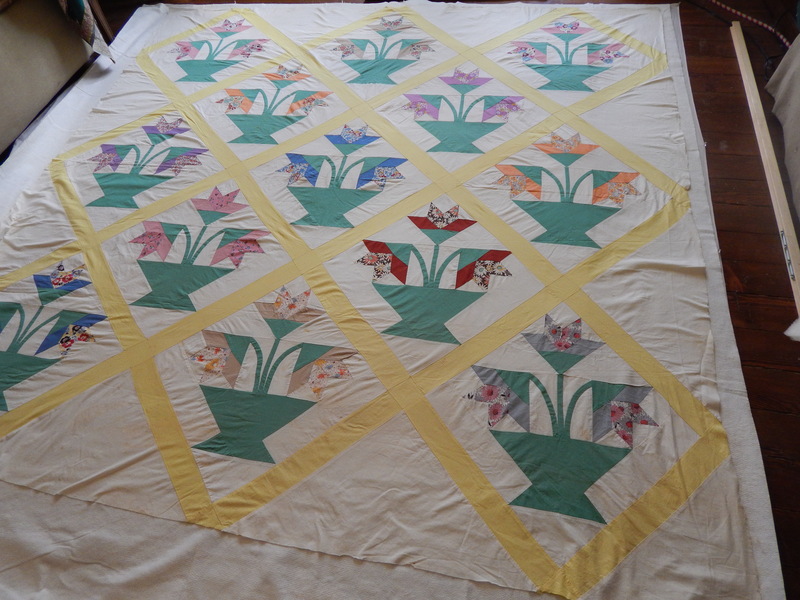 Lovely quilt top and a big thank you for the step by step explanation of your methods. Thanks I will definitely try this for the next binding. It looks and finishes up great. Super time saver.